There's nothing like an Hawaiian Shirt to make you feel like your on vacation. You'll love the mid-century charm of these vintage Hawaiian shirts designed by Reyn Spooner. When you picture a tropical Hawaiian shirt in your mind, there's a very good chance that you're picturing a Reyn Spooner Hawaiian Shirt. Reyn Spooner hit the Hawaiian fashion scene in 1961 when a California fashion mogul named Reyn McCullough moved to Waikiki and met seamstress Ruth Spooner. The duo decided to pair collegiate button-down shirts with the vibrant prints popular in Hawaii. By 1962 McCullough had bought out Ruth Spooner. McCullough died in 1984 and various corporate entities have owned the brand since that time. So if you truly want an authentic Reyn Spooner Hawaiian shirt, then vintage is the only way to go. Hawaiian shirts are known for their mid-century themes. I love seeing men in a Hawaiian shirt plastered with muscle cars, corvettes, and mustangs. If my husband would let me, I'd have a hula girl bobblehead on the dashboard of our truck. Palm trees and surfboards remind me of those wonderful mid-century surfing movies. I'm always on the look out for a vintage Hawaiian shirt for my dad. He lives in them in the summer. You can scout out all of the thrift shops and yard sales in your neighborhood or you can just look at some of the great Reny Spooner shirts found on eBay. As you can see from looking at the vintage Reyn Spooner shirts below, he loved American cars and the culture that went with it. . There was a time when the world wasn't so small. People on the mainland United States only dreamed about seeing Waikiki. When the Beach Blanket Bingo Movies came out, they brought people a new and exotic world. From surfing to Hawaiian shirts, people embraced this laid back culture. Wearing a Hawaiian shirt was a way that people could be a part of the scene that they could only dream of. Hula girls in their scandalous grass skirts and leis became one of the images that defined Hawaii, so we shouldn't be surprised to see them on so many Hawaiian vintage shirts. The print above is a classic Reyn Spooner. The white tropical flower on the ocean blue shirt. They stylized male and female hula dancer figurines shown on their pedestals with Hawaii on them. In my mind Waikiki Beach is a series of palm trees with surfboards leaning up against them. I grew up on the coast of Maine - about as far away from Hawaii as a kid can get. I love the rugged coast line of Maine, but there isn't a palm tree in sight. The waters are great for lobsters, but not so great for surfers. The Reyn Spooner print shown above shows a dark green background with palm trees, surfboard sit on top of them. Many of the surf boards have brightly colored prints. I think of Hawaiian shirts as coastal shirts. My Dad looks great in his as he paddles around our Maine beaches. Lush and colorful hibiscus flower make me think that I am in a tropical rain forest. I love the bright and vibrant flower beds that are all over Hawaii, even in the winter. There is nothing like a brightly colored tropical shirt to bright our spirits on a rainy day. I would say cold winter day, but these crazy shirts are made of cotton. I would have to layer insulated underwear and a turtleneck under one of them in our sub-zero winters. Not all vintage Hawaiian shirts have brightly colored flowers. Others are more muted. Of course many of these shirts are 20 or 30 years old. A certain amount of fading is to be required. I just like to think of them as broken in. I love the way that worn and faded beach clothes look. I am particularly happy when I get to spend enough time in the sun and on the beach that my clothes fade. However, Hawaiian shirts are often made to have that faded look from the start. It's called a reverse printing, because the print is put on the reverse side. Sometimes people who don't know this think that the person has their Hawaiian shirt on the wrong side. 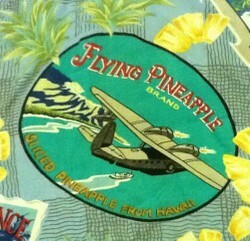 You'll find all sorts of wonderful prints and themes on a reverse print Hawaiian shirt. I see a lot of old Hawaiian shirts on the coast of Maine. In some ways I find this curious. It's not just the tourists who are wearing them. My Dad has dozens. Heck I give him one on Father's Day every year know. I have four brothers and they love them as well. While some people have ugly Christmas sweater parties, the men in my family seem to love to bring out their crazy shirts for the holidays. I do hope that this trend doesn't mean that I am doomed to attending crazy Hawaiian shirt parties on New Year's Eve. Would You Wear a Hawaiian Shirt? I can see you on one of your cruises, sipping a tropical drink and wearing a Hawaiin shirt. Oh, the spirit of theses tropical Hawaiian shirts is incredibly alluring! Would I wear one? You betcha! These are very pretty, each shirt has got a very special and unique look. I love the Hawaiian designs! I'm glad you like them WriterArtist. I love the nature-inspired prints too. Love the Hawaiian designs, reminds me of beautiful mountains, flora and fauna. I think certain prints are more desirable than others. I noticed that shirts certain prints with corvettes were very expensive. These are excellent prices for a vintage shirt. I just saw a travel episode on Hawaii, and there was a specialty show where these shirts were selling for thousands of dollars. There are many styles, colors and cuts to choose from when deciding on a design dress shirt for men. Here are some of the top designs to assist you when you buy your next shirt. Perfect patriotic shirts and clothing to express your loyalty to the United States.